Lately, I’ve been pitching Du Bois differently, paratextually, via the images that flooded the Crisis offices, particularly in response to the Education and Children’s Numbers of the magazine. In the unsubtle space of the lecture hall, I’ve presented a simple “it’s hard to be what you can’t see” message, projecting slide after slide of black graduates, young men and women in mortar board and tassel looking proudly at the camera. As would-be graduates themselves, my students seem to resonate more strongly with this approach. But spending time with the images and letters in the University of Massachusetts Du Bois archives, I hear a different voicing of my students’ initial skepticism, an objection with which Du Bois would wrangle, and one we see in the discussions of close and distant reading in literary studies. It is a tension between hot emotions and cool analysis, one between individuality and exemplarity. In political and pedagogical work alike the scale of analysis matters, and the solution is not so simple as opposing or even synthesizing scalar extremes. Questions of distance matter in a particular way when helping students approach minority-authored texts. Du Bois’s sociological tendencies can, at first encounter, harden bad scalar habits of approaching historical documents of black life. Although all “old” texts bear the burden of representing the past, this burden perhaps weighs especially heavily on the works of minority authors. Whereas white authors may be particular, black authors are either seen as speaking for the race, and thus operating on a very large scale—or, for students who insist upon race blindness, black writers are “just people,” a kind of localizing move (Du Bois is just Du Bois, not black) allowing universal feelings of identification that are equally problematic. What I propose in this essay is that the paratextual materials surrounding Du Bois’s writings, and the Crisis “Children’s Number” in particular, dramatize struggles with exemplarity and particularity in a pedagogically useful manner. And further, that the shuttling back and forth between scales that emerges in the contest between Du Bois and his readers may be the kind of scalar activity best suited for helping orient students to black modernity. Fig. 1. “Ophelia,” from the October 1919 issue of The Crisis. In the UMass special collections Du Bois’s readers can be heard asking a question very near to that of my first-gen students. The question goes something like this: okay for you, Dr. Du Bois, but what about my babies and me? Ophelia wants to be somebody’s baby. She has never known the love and gentleness that most little babies find waiting when they come into the world, for her mother “gave her up” when she was very tiny. She is now four months old and in splendid physical condition. She is light in color, with soft, pretty hair, and round, bright eyes. She comes of good family. If Ophelia is to grow into a healthy, happy little girl, she must have a home and the care and affection of a kind father and mother. Anyone who is interested should write immediately to THE CRISIS. But in addition to traversing one little girl’s journey to adoption, when Du Bois ties her future to text—“Anyone who is interested should write”— Ophelia also begins her expansion into a paratextual being. Many anyones do respond to Du Bois’s call, sending the contemporary scholar and student to seek Ophelia’s fortunes in new textual, visual, and regional spaces. The letters in the archive come from Philadelphia, Oklahoma, and Texas. And, as Du Bois reports in the next issue, many more fill his mailbox. Within the follow-up column, in which he notes that Ophelia had “twenty-six states and one hundred and forty-six towns to choose from!,” Du Bois reminds his readers of the magazine’s extensive geographic network, making the matter of one black child’s adoption speak to larger matters of black publishing and reading practice (“Opinion,” 337). At the level of text, then, Ophelia and her potential adoptive parents evidence a national black middle class full of respectable potential families. How my heart did spring for joy when I read the want ad for little Ophelia. We should be very glad to get her and to be a real kind father and mother to her and also to educate her to the highest. The only thing lacking around this home of ours is a darling sweet baby and I think Ophelia would be satisfied with her new home for we would do every thing to make her a happy, healthy baby. We are both christians, belonging to the catholic church. We have a six room house and a seven passenger car awaiting her arrival. Here, Mrs. James’s bodily reaction spurs a flight of fancy that places baby Ophelia within a very specific domestic scene, wandering the rooms of the James’s upper-middle-class home and touring in the “seven passenger car” that awaits her arrival. By engaging both text and paratext, the contemporary reader shifts scales of analysis, allowing the national and the local as well as the political work of Du Bois’s exemplary orphan and the personal yearnings of the individual would-be parents to exist in a layered vision, rather than one eclipsing the other. Such multi-scalar shuttling allows us to see more, but may require resisting the contemporary reader’s own desire to extrapolate from the particular. In the edited collection The Correspondence of W.E.B. Du Bois, for example, Du Bois’s spare paragraphs are made to seem typical. The editors note, “There were few services that Du Bois’s Crisis did not perform. From time to time, for example, the magazine helped arrange for the adoption of a child. In the October 1919 issue (18:287), a baby named Ophelia was so offered.” What’s unclear, however, from a perusal of the children’s issues from this time is whether this practice occurred more than once. As readers seeking meaning, we may wish to press particular instances into larger significance, but risk losing specific and local meanings in the process. I admit to pushing timid undergraduates to scale up in such a fashion when I talk about close reading—“Don’t be afraid to riff a little; what are you seeing here?” This small girl in a bit of column is so suggestive: with her literary name, Du Bois’s perhaps eugenic descriptions of her good breeding, and a very middle-class portrait, Ophelia may be a little baby, but she is also a wonderful anecdote. And she’s an anecdote with a heightened affective charge—an orphaned baby! —thus exemplifying the secular humanist appeals Heather Love has located in our disciplinary commitments to the close and deep as well as what Lauren Berlant describes as both the potential and the danger of “the case.” Introducing Critical Inquiry’s special double issue “On The Case,” Berlant explains, “This project presumes that to ask the question of what makes something a case, and not merely a gestural instance, illustration, or example, is to query the adequacy of an object to bear the weight of an explanation worthy of attending to and taking a lesson from; the case is actuarial. It raises questions of precedent and futurity, of canons of contextualization, of narrative elucidation.” Ophelia is an awkward case, not the sort of exemplar the editors of Du Bois’s letters seem to wish her to be, nor precedent-setting for Du Bois’s future social work through the magazine. However, citing Andrew Abbot, Berlant reminds us, “It is precisely in the reflection about what x is a case of that real theory arises,” and, a little later in the essay, she cautions that the singularity of some cases opens them to broader significance: “Sometimes, though, an event more than perturbs; it disturbs, creates a louder noise that opens up the field of debate about expertise, modes of description, narration, evaluation, argument, and judgment” (“On the Case,” 669, 671). Though Berlant here imagines the particularly scandalous case, with the matter of Ophelia, and as I’ll suggest momentarily, the babies who appear throughout Du Bois’s publications and letters, we find ourselves in the realm of cases that are particularly sticky, not for their scandalous nature, but for the emotional intensity surrounding infantile examples. As one shifts between the nationalist vision expressed in Du Bois’s writing and the more local and personalized claims of the letter writers, it is precisely a debate about what kind of example one’s child can be that emerges. I would like very much to know if the Babies that came out in your October number are they Orphans? The reason I ask. I have several families that have no children like myself and they own nice homes and are able to take a child and give it the best care and education and if some one has beat me to Little Ophelia please look out for me another and let me no how to get her and on what terms. My wife wrote you concerning a baby girl and I hope we wont be disappointed. We colored people hear don’t and can’t get our own colored orphans the whites take them and put them in some place they call a home, just raising them up for their own use. I am married and have a nice home and a couple of lots. But home don’t seem to be complete without children somehow. And myself and wife would be so proud if we could adopt a little girl of our own. So do the best you can for us and you will never regret it. I will pay you for your trouble. Here the Lesters’ toggle scales, moving between an appeal to the broader legal and political situation of black communities faced with racist adoption policies and their strong personal desires to “complete” their home with a baby of their own. Moreover, this letter also indicates the distracting pull of the images accompanying The Crisis’s text, which lead Mr. and Mrs. Lester to conflate Ophelia with other babies in the magazine. 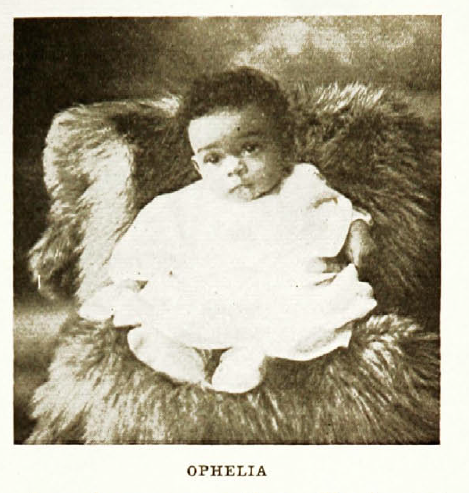 Here, the photos appearing throughout the issue reverse the typical relation between Du Bois and his description of black children—while he only writes to promote the adoption of one child, the appealing images of children throughout the issue lead the Lesters to imagine Ophelia to be a much more exemplary case than she was. Du Bois replies, “The difficulty about our Children’s number is very easy to explain: —we receive four and five times as many pictures as we can possibly publish . . . However, we are going to publish a book especially for children, called the BROWNIES’ BOOK, and we hope in that to have more space for the interesting children’s pictures.” From the archives, we don’t know whether Du Bois found the Garey children’s images “interesting” enough to print. What we might imagine, though, from reading Mrs. Garey‘s letter, is that she’d likely be unimpressed with Du Bois’s response, or with his habit of printing photographs of children unlabeled, simply listing the numbers of children present in an issue—“Pictures of Seventy-four Colored Children,” reads the October 1919 Crisis’s table of contents. Despite the seeming indication of abundance in this caption, Mrs. Garey’s letter as well as the photographs of various children and graduates sent into the magazine evidence the much larger group of individuals never pressed into service as examples for the race. If, for Du Bois, art must be propaganda, the letters in the archive make different claims, as the impulse of I, me, mine demonstrates an insistent indifference to Du Bois’s concerns for exemplarity and scalability. We see misunderstandings, too, in anxieties about scaling our scholarly loves. For example, eminently patient ambassador for the digital humanities Ted Underwood has spoken to the false divide between “distant” and “close” reading as a confusion that keeps conversations among literature scholars “needlessly parochial and polemical.” Or, more provocatively, as Katherine Bode argues, distant and close reading may amount rather problematically to the same thing: "Where distant reading and microanalysis are celebrated—or decried—for their departure from close reading, these approaches share a disregard for textual scholarship and an assumption that literary works are stable and singular entities.” For Bode, close and distant reading alike would be better served by a less exclusionary vision of textual meaning. One example of this kind of scholarship forms the mission of The Black Press Research Collective, a DH group founded by Kim Gallon, which “strives to avoid homogenizing newspapers of the Diaspora but to explore how they operate in specific periods and settings.” Bode’s and Gallon’s calls to keep multiple scales in view appear motivated by the ethical treatment of texts themselves, but answering these calls has the added benefit of keeping options open for the scholar and teacher. In the context of my own students, the case of Ophelia shows what becomes pedagogically possible when we resist choosing scales and instead see the dilation and contraction of our reading practices as a crucial interpretive activity, rather than a process of arriving at a fixed perspective. Establishing a truly multi-scalar reading may mean turning more and more frequently to a topic’s dispersal across language and image, text and paratext. Tracking the geographically and also textually dispersed Ophelia across the archive allows a quotidian black modernity to emerge, one that includes deep longing, interpretive errors, personal aspirations, political ideals, and private claims on children. Whether considering differences in state-based adoption practices, catching glimpses of personal domestic life, or (for example) looking with students at images preserved in the archive but not selected for inclusion in the magazine, paratextual multi-scalar reading might allow us to have more robust conversations about Du Bois’s visions of black modernity and who is left out of these visions, failing to rise to the level of example. Perhaps most importantly, a multi-scalar investigation that reveals the tension between Du Bois’s national and racial commitments and the more individualistic wants of parents and would-be parents makes poignant the way desires for representation can be both deeply personal and broadly political. I’d like to thank Laura McGrath for her help with this essay. Research in the Du Bois Papers was made possible by grants from the Modernist Studies Association and the University of Nevada, Reno. W. E. B. Du Bois, “Opinion,” The Crisis 18, no. 6 (1919): 283–87, 287. W. E. B. Du Bois, “Opinion,” The Crisis 19, no. 1 (1919): 335–37, 337. Laura James, “Letter to Crisis,” October 18, 1919, MS 312, W. E. B. Du Bois Papers, Special Collections and University Archives, University of Massachusetts Amherst Libraries. The letters appear here as they were written. Spelling and punctuation are as they originally appeared. The Correspondence of W. E. B. Du Bois: Selections, 1877–1934, ed. Herbert Aptheker (Amherst: University of Massachusetts Press, 1997), 235. See Heather Love, “Close but not Deep: Literary Ethics and the Descriptive Turn,” New Literary History 41, no. 2 (2010): 371–91. Lauren Berlant, “On the Case,” Critical Inquiry 33, no. 4 (2007): 663–72, 666. Donal Harris, On Company Time: American Modernism in the Big Magazines (New York: Columbia University Press, 2016), 62, 82. Press and Laura Lester, “Letter to Crisis,” October 19, 1919, MS 312, W. E. B. Du Bois Papers. C. C. Garey, “To W. E. B. Du Bois,” October 1919, MS 312, W. E. B. Du Bois Papers. W. E. B. Du Bois, “To Mrs. C. C. Garey,” October 23, 1919, MS 312, W. E. B. Du Bois Papers. Ted Underwood, “Distant Reading and Recent Intellectual History,” Debates in the Digital Humanities (2016). Katherine Bode, “The Equivalence of ‘Close’ and ‘Distant’ Reading; or, Toward a New Object for Data-Rich Literary History,” Modern Language Quarterly 78, no. 1 (2017): 77–106, 91. “About,” The Black Press Research Collective. New work on Du Bois’s sociological vision offers yet another important avenue for considering the significance of scale to understandings of black modernity. Published this year, Whitney Battle-Baptiste and Britt Rusert’s new edited volume W. E. B. Du Bois’s Data Portraits: Visualizing Black America (Princeton, NJ: Princeton Architectural Press, 2018) is already an indispensable resource for the field.